As the Holidays approach I always feel the essence of Magic all around us. This energy is always present but feels stronger this time of year because of the excitement and anticipation of getting gifts for our loved ones and planning get-togethers with everyone who is important to us. Yet I know that for some people this Holiday time brings anxiety as maybe their finances aren’t available for giving to others and for many people there is a feeling of loneliness during this time. This year Ziad Hashash, one of the co-facilitators of a group that I participate in, talked about Worthiness and that it has been something we have had to prove throughout our lives. This was a very powerful message that I thought I could share in my way to assist you to feel worthy of enJOYing the Magic of this wonderful energy and time of year! How powerful is this message to receive over a Holiday Season filled with Magic? The Magic that is available to us during this special time is because True Love exists in Giving. Too often we focus on what we want, need or desire or have expectations about because when we give we are expecting that we will receive something back in return. This creates expectations and conditions on what we give. Instead of giving from our Hearts to another; we are giving because our ego is desiring something in return. This then brings us to worthiness. If we give something then we should ‘get’ something and getting something will help confirm that we are worthy. So why do we give conditionally? Because we believe that in order for us to be worthy of receiving gifts, we must be seen as worthy and we do this by giving gifts. Often as children we were disappointed around Christmas because our focus was often placed on receiving – as media prepares us as children to desire certain items by bombarding us with all the newest and best Christmas toys available on the market. Then we are told that Santa has a naughty and nice list so to be worthy of receiving what we want, which we are encouraged to share with the mall Santa or in a letter, we must be Good! When we don’t receive our list – our expected items – we automatically perceive this as us somehow failing to be worthy of receiving what we desired most! We perceived this as a child that we were Not Worthy! Unfortunately, we rarely are explained to that our parents didn’t have the money available to give that expensive gift, as it was a gift ‘supposedly’ from Santa, not our parents. And since our friends received lots of gifts (or claimed they did) we compared ourselves to them and perceived the lack as our own failure and unworthiness! 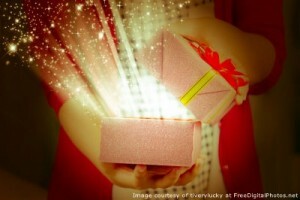 And we hope that if we give the perfect gift to someone we love they will in turn gift us the same. How many times has this actually worked? Maybe now we can be more conscious of the underlying reason we feel the need to give conditionally: that this Magical season was somehow unconsciously ingrained in us that our worth was attached to what we received instead of what we gave. Now with this perspective we can understand that our need to receive that perfect gift was attached to our worth instead of to the Heart for which the gift was given and we can see of course that the Magic isn’t in receiving at all but in Giving from the Heart. Imagine if we could have received this message as we grew up? How different our lives could have been! Of course we still seek acknowledgement for the gifts we give in hope that we will be found worthy but this need to feel validated, again, lies outside ourselves and is based on whether we feel worthy of even giving. After all, if we believe that we get our self-worth, our worthiness, from the outside and when we don’t receive what we desire even with our gift giving to promote a return gift to ourselves, how easy is it to continue giving gifts that do not produce the desired result: the feeling of worthiness. It’s almost amazing that we continue to give gifts if we are basing our giving on the possibility of receiving something in return, something that will enhance, hopefully, our self-worth because, for many people, the gift is not returned or not returned in the way that will enhance one’s self-worth. The true Gift of the Magical Energy available to us – especially at this time of the year – isn’t what we receive or how our gifts are received by others: it is in the unconditional Love through which we give. If we knew that our worth wasn’t conditional on who we gave to or what we gave, that our Worth exists within us at the very core of our Being and Heart and that absolutely nothing could affect our Self-Worth, would we feel differently about this Magical Time? So could you Open your Heart to the Magical Possibilities that are all around you and Let that Magic Inspire you to Create the Love that is Unconditional and Accepting of our Life and World? Could you Know that Love abounds and Magic exists to Create, Play and Dance within your life? Could you Give with Your Heart and Share this Magic to everyone you meet – even if it’s just a smile or a word of encouragement. Could you BE Grateful to be a part of the Magical World? This time, this Magical Time, always inspires me to Hold Love within my Heart. I hope that you can capture some of the Magic for which this was written and KNOW how Worthy you are! Happy Holidays From My Heart to Yours! This entry was posted in Blog and tagged Happy Holidays, Intuitive Counseling, intuitive counselor, Intuitive Soul, Laurie Huston, Magic, Magic and Worthiness, Magic in the Holidays, Spirit of Christmas, Ziad Hashash. Bookmark the permalink.